One thing that you should do first is to go to the location of your Joomla installation, look up the file called htaccess.txt, and rename it to .htaccess. 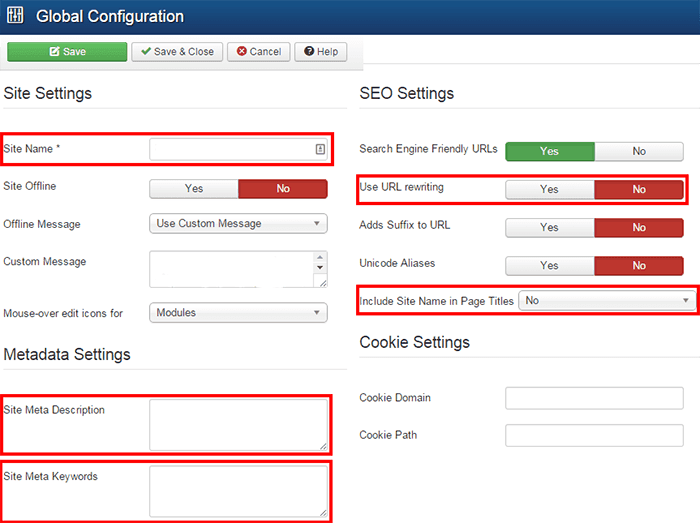 Then, assuming you already installed Joomla, go the Global Configuration screen, and fill in the required parameters. I only indicate stuff that might need changing. If the default is fine, I will not discuss it in this article. Use URL Rewriting: Set it to Yes. 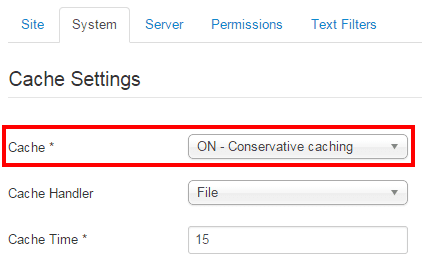 This ensures the index.php string is removed from your URL's. Include Site Name in Page Titles: Often a good idea (not always). Doing so prepends or appends the Site Name to you Page Titles. Creating a template override. This is often the best option, but it's a bit technical. Play with the article options, by switching off the display of the article title in the article options, and by typing in an H1 in the article editor. If all this sounds to complicated, just skip it. This something that can be corrected at any time, without issues. Page title: This is the <title> element in HTML (used for the first line for your site in the Google search results). It is usually made up of either the article or menu-item title, possible preceded or appended with the Site Name (if switched on). Make sure the combined length is under 65 characters, while still being as relevant as possible. Using an extension like OSmeta (or SH404SEF for advanced users) can help you to keep an overview and make further customizations. Every image should be optimized for both SEO and performance. It already starts when you create the image on your PC: Make sure you give it a file name that is relevant for the image. If it is an image of a bird, name it bird.jpg, etc. Secondly, make sure you make it as light as possible. An image quality of 60% is often good enough for the web, and it can save you many kB's. Also, crop it to the exact size you will use it for. Also, there are dozens of optimization techniques you can use to save further kB's (Smush.it, responsive images, bas64-encoding, etc.). Make sure you build a proper and logical structure, especially if you have a larger site. 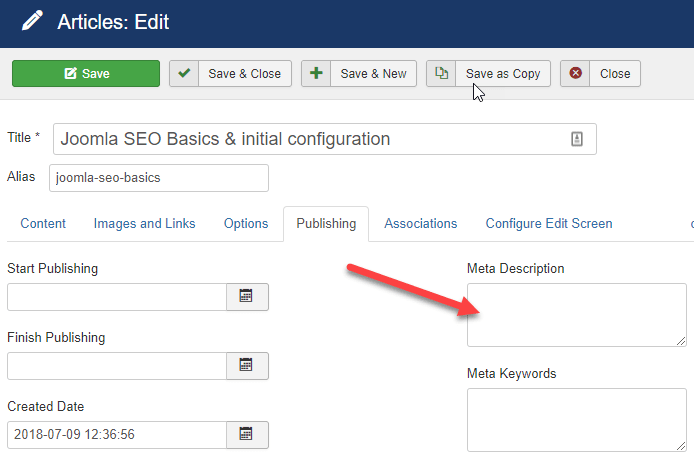 Subdivide your articles in categories and also make sure to properly open up these categories in the menu-structure. As an example, here on this site, I have categories for SEO, Speed, Extensions and Blog, and all are collected to a separate menu-item. It sounds so simple, but a proper structure is really the foundation for proper SEO. This blocks access for Google to folders that are relevant for understanding your site. With new Joomla installs, these lines are no longer active, but if you have an older site, make sure to remove the lines for images, media and templates. Duplicate content can be a real killer for your SEO efforts. Especially avoid linking the same article to multiple menu-items. Also something that can often be fixed quite easily, is to avoid access to both the www and non-www version of your website. Using some simple rules in your .htaccess file can easily fix this, making only one of those accessible, and routing traffic from the non-preferred to the preferred one. And, if you SSL, amke sure to enforce the https version. Other means of avoiding duplicate content can be achieved with further .htaccess tricks and use of canonical URLs. Often this is stuff for advanced users. I see many beginners trying to use these, often doing more harm then good! Avoid changing URLs in your website. If you rename an article or a menu-item, make sure to retain the alias, as otherwise your URL will change. If you do have to change this, make sure you create a so-called 30-redirect that leads the old URL to the new one. You can use the Joomla core Redirect Manager for this. Also make your template displays a nice-looking errorpage to your users instead of the ugly default Joomla error page. SEO is often a process of many small steps and optimizations, and there are many more steps to take, but for this I advise you to read the other SEO articles on my site, or read my book. However. One last step I definitely advise you to take is to register your site with Google Search Console. The process is pretty easy to do, and Google will instruct you of the steps to take. Especially with new sites, registering them speeds up the indexing of your site a lot! The one task within the tool you should absolutely perform is to submit the URL of your sitemap.